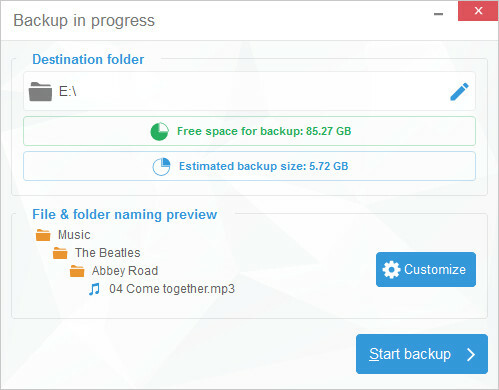 With Manual Backup you decide what tracks to transfer and where to transfer your music – to iTunes or to a folder on your computer. In this article, we will explain a bit more about how you can work with the Manual Backup. Note: If “Manual Backup” is not possible, please follow these troubleshooting tips. Select the tracks you wish to transfer in the program. Once the tracks have been selected, click the green “Folder” button at the top. You will be asked to select the folder where you want to transfer your music files. No limitations here – you can even select the external hard drive if you’d like. Destination folder: folder or external hard-drive where track files will be backed up. File and folder naming preview: how will track files be named and organized within the destination folder. You can play around the setting as much as you want! For example, have all music sorted by albums in the main folder, regardless of the artist. When satisfied with custom settings return to the “CopyTrans is ready to backup” window and click “Start Backup”. CopyTrans will start copying files and display detailed information on the progress. If you see the summary window, it means that the tracks have been copied from iPhone to computer. Selected tracks are now in the destination folder exactly the way you wanted them to. For the seamless and fast transfer of your iPhone music to iTunes, we recommend using the Smart Backup option in CopyTrans. But if you need a little more control over the copied files, the Manual Backup is just for you. First, you need to select the track for transfer. 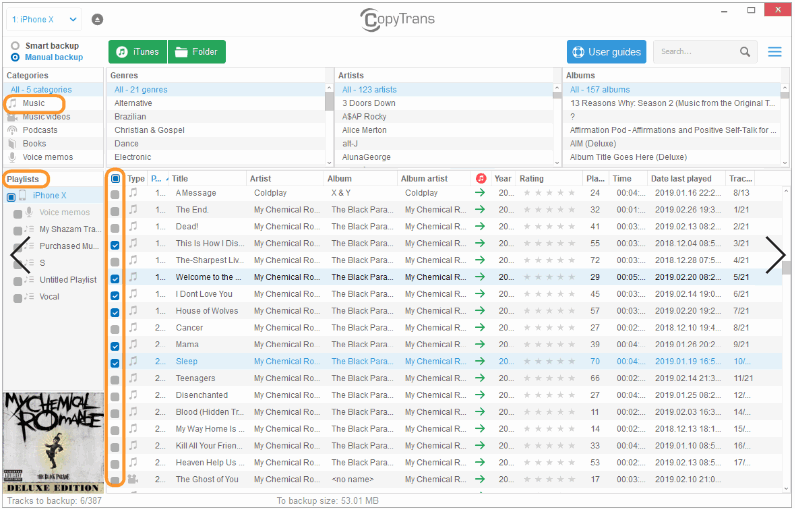 CopyTrans offers a detailed status of a track. To check it, simply hover your mouse over it. This track is not in iTunes. Track should be transferred. This track is in iTunes but is not up-to-date. Track should be updated. This track is in iTunes and is up-to-date. Track should be skipped. 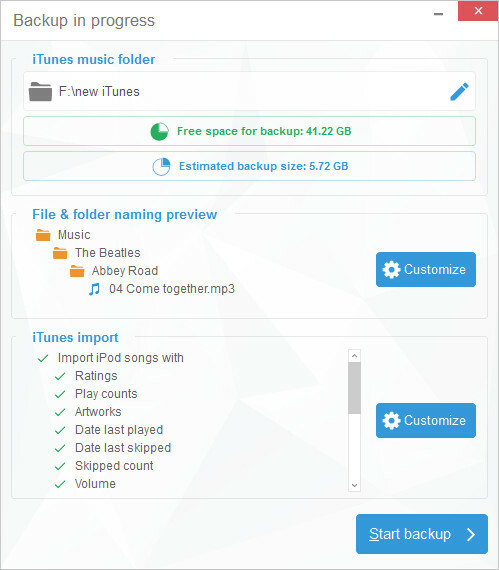 Once tracks to transfer have been selected, click the “Backup to iTunes” button in the top-right corner. iTunes music folder: where your track files will be copied to. File and folder naming preview: how will track files be named and organized within the iTunes music folder. iTunes import: which track information will be transferred. For example, if you want all your track files to end up in a unique folder (no subfolders) set all 3 drop-down menus to blank. As easy as that! “Import iPhone songs with”: allows you to select exactly what track information should be backed-up to iTunes. “Import iPhone playlists”: defines if CopyTrans should backup selected playlists or not. Add prefix to playlist name: date or assign all playlists to a user (e.g. 11-10-2009 Rock or David Rock). When you are done, return to the “CopyTrans is ready to backup” window and click “Start Backup”. The backup to iTunes will start. You will be able to check the progress of the transfer in the dedicated window. Once you are all done, you’ll be given a detailed summary. 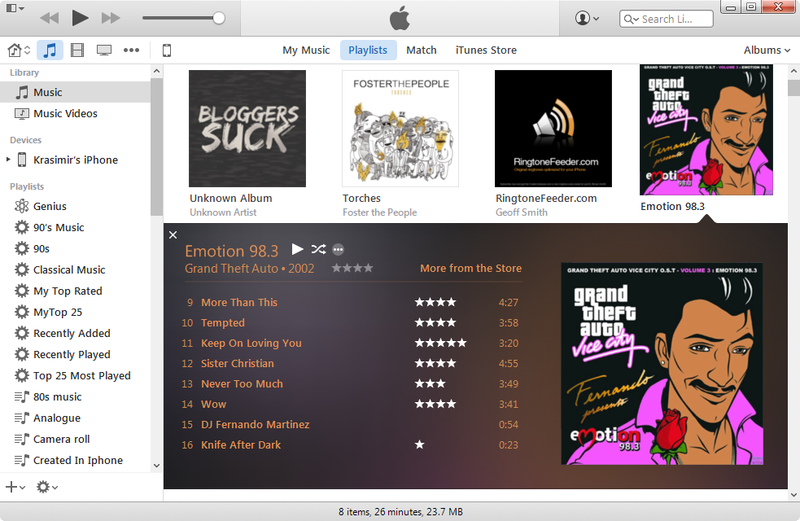 All chosen tracks, track information, artworks, and playlists are now back in iTunes exactly the way you wanted them to.